During WWII, preparations for the harrowing 36-day Battle of Iwo Jima took place on Guam, on the “Big Island” of Hawaii and on Maui. On Feb. 23, 1945, American flags were raised on Mt. Suribachi, signifying Allied determination, jointness of effort, and victory with the great sacrifice in the Pacific. The capture of Iwo Jima saved thousands of B-29 flights and the lives of over 25,000 Army Air Corps Crewmen. 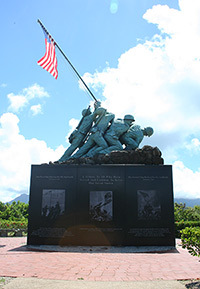 A symbol of this victory, the Pacific War Memorial in Hawaii, is located on Marine Corps Base Hawaii, Kaneohe Bay. 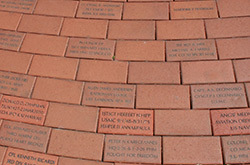 Help us pay tribute to all those who have served to protect our freedom. Surrounding the base of the Pacific War Memorial is a “Walkway of Honor” with (4×8 inch) engraved stones paying tribute to veterans, active duty personnel, their loved ones, and other individuals who have contributed $100 or more as supporters of the DoD and U.S. Military. The Officers’ Club at Kaneohe Bay continues this tradition maintaining the permanent memorial. To place an order, fill out the form below, download this PWM PDF to mail/fax, or visit The Officers’ Club. Once your application is submitted, we will contact you to confirm the order and collect payment. You may pay via phone, mail or in person at The Officers’ Club. There is a maximum of 3 lines of 20 characters (spaces and punctuation marks are counted as characters). Message is subject to approval by The Officers’ Club at Kaneohe Bay Advisory Committee.